Noatum Terminal Malaga has launched a rail service for import/export containers between Madrid and the port of Malaga, Spain. The new service was initiated following the decision of Noatum Terminals, the terminals operating division of Noatum Maritime, to engage in local container traffic, informs the company’s press service. Having invested in additional equipment to handle containers at the yard and at the quayside (3 Super Post Panamax STS cranes by Noell were re-positioned to the terminal from Port Said in June), the terminal operator starts the first ever container rail service at the port of Malaga. This also marks the revival of rail freight services for the port, which were interrupted in 2013. The first train came at midnight on September 12, having left Madrid at 11.00 am of the same day. It was 300m long and brought 40 TEUs loaded with technology components. As informs the local daily SUR, at the moment, the service is dedicated to the German shipping line Hapag-Lloyd, which has included Malaga in its Mediterranean Canada service (MCA) since September 2018, thus replacing the line’s previous call to Algeciras on this route. From Malaga the Hapag-Lloyd’s vessels will first head to Tangier and Vigo, ultimately ending the service at Montreal, Canada. According to Hapag-Lloyd, the transit time from Malaga to Montreal is just 10 days. The Madrid-Malaga container train will operate on a weekly basis. 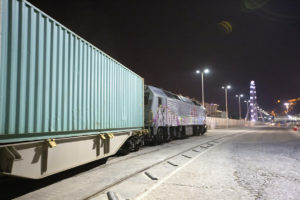 Once the operation is fine-tuned, the train is expected to grow up to 500m and also to have the back loading, thus generating new opportunities for local Andalusian companies to transport their containers by rail to the Spanish capital. In 2017, Noatum Terminal Malaga handled 73,000 TEU and 54,000 vehicles as well as over 1,150,000 tons of bulk cargoes. Noatum Maritime anticipates further improvement of these volumes in the coming years, if the terminal maintains the current standards of competitiveness and the market growth trends persist.